DIAL: White Roman dial with printed numerals and beveled date aperture at 3 o’clock. CONDITION REPORT: Excellent condition, all original. NOTES: Includes original Rolex USA stamped papers with US distributor stamp on the back indicating 1984 delivery to the retailer. 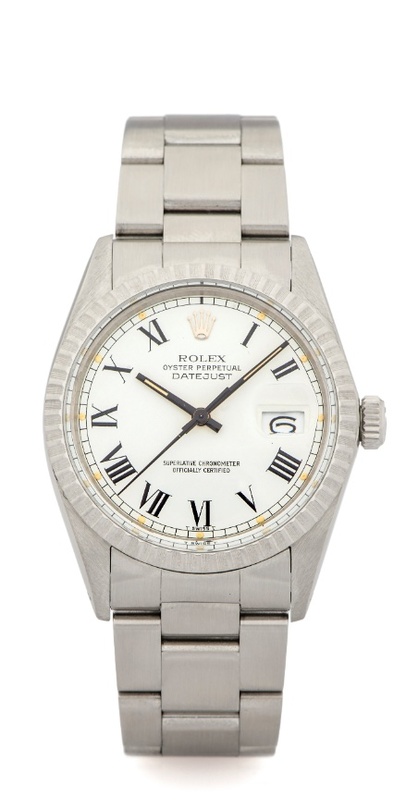 The Datejust is considered to be one of the most classic and iconic models of Rolex. Introduced in 1945, the Datejust was the first wristwatch with a chronometer movement featuring an automatic calendar and a first to jump precisely at midnight. It was also the world's first fully waterproof wristwatch with automatic winding and central seconds-hand. The size of 36mm in diameter, the shape of the Oyster case and the cyclops that magnifies the date window by 2.5 times are the hallmarks of future Rolex models. The Datejust is still the king of vintage watches as it offers a story, a reliable automatic movement and the date. Essentially, it satisfies all essential criteria one is looking for in a vintage Rolex.